You have done everything in your power to resolve any issues, yet the tirades continue, the verbal/physical abuse won't stop and you're at your wits end. Even though it's not your fault, you feel nothing but failure, frustration and hopelessness, and your self-esteem is at an all-time low. This cycle of behavior is what your abuser uses to keep controlling and manipulating you, making you feel as if you're about to lose your mind. An impromptu poll was taken from victims of domestic violence, and 80 percent say it is worse to be emotionally abused, while 20 percent say it is worse to be physically abused. However, that does not negate the danger and trauma of physical violence. The broken bones, black eyes, and hospital visits are nightmares that no one should have to suffer. Nor should you be called names, degraded, lied on or made to feel less than the wonderful person you are. Money should not be withheld, or family not allowed to visit in an attempt to control you. This type of behavior is exhibited by a person who is insecure. When you can safely, seek help by calling the national Domestic Violence Helpline at 800-799-7233. They have counselors who can point you in the right direction. Also, seek out a person you trust that has your best interests at heart. You are beautiful and deserve the best! 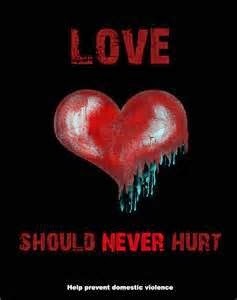 Always, because LOVE SHOULD NEVER HURT.